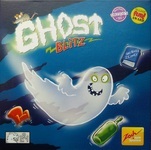 Terra Infinity have released Ghost Blitz, a digital conversion of a board game by Jacques Zeimet. The app is free for both Android and iOS and features no adds or in-app purchases (?!?). The game is a casual quick reflex color/object matching game that anyone can learn to play. Suzanne S does a great job of profiling it in one of her "Board Game Apps in 2 Mins" series videos linked below.